In Phill’s early years, Jackson Hole’s art community was very influential and encouraging to Phill. Several well-known artists living in the valley, including Conrad Schwiering, John Clymer, and Jim Wilcox showed him that you could actually make a living as an artist. Becoming an artist was Phill’s ultimate goal, yet he realized it would take time to develop his talents and find his unique style of expression. He learned and studied many art techniques and enjoyed painting in various medias such as watercolor and acrylic. Ultimately he found that he excelled and enjoyed working in he “king of media”, oil paint. 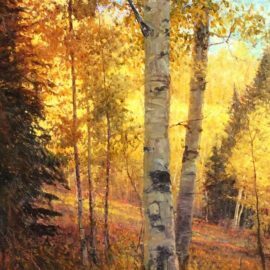 Phill’s impressionistic approach to painting became his forte because he loved exploring the play of light in landscapes. 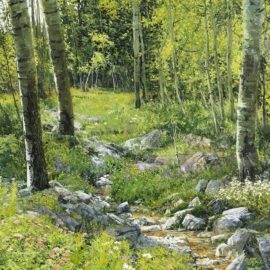 His interest and flare for impressionism is primarily sparked by his study of the early French impressionists such as Claude Monet and the illustrative art of Thomas Moran. Their influence on his style is still evidenced in his paintings. Today, Phill Nethercott has mastered his own style and skills. His paintings are hanging in many homes, businesses, and art galleries. He now paints full time, fulfilling his dream of making a living as an artist. Looking back on many of his life experiences, Phill realizes he has learned many things about himself as a person, and as an artist.